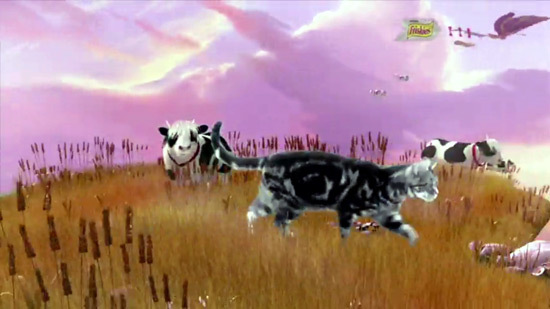 What do cows look like in the Friskies cat food commercial Adventureland? 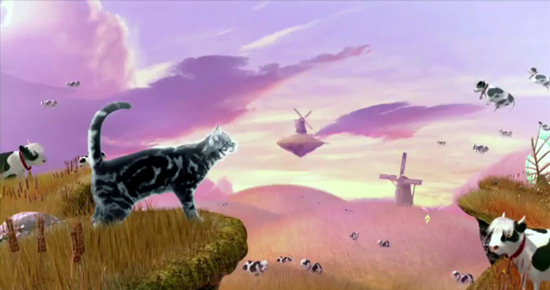 While catching up on a few TV episodes on my computer today, I was lucky enough to view this Friskies commercial for cat food, appropriately titled “Adventureland”. The show doesn’t stop here. After happy cows grazing in the fields, you get to see flying cows! 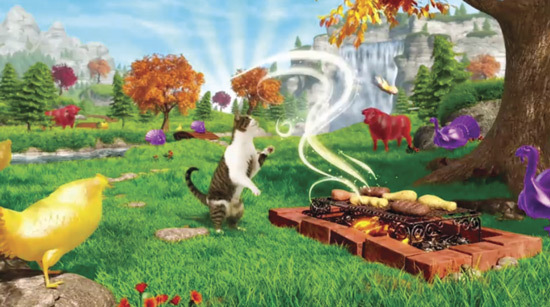 Between the cows, the turkeys, and the fish, this adventurous cat gets very hungry and can’t wait to be back in the kitchen to tastes his Friskies cat food. 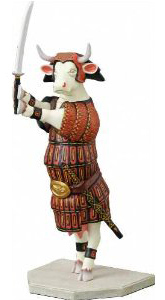 Did you see the red cow at 0:08 seconds? Alright, Mr. Friskies, spill the beans! Do you put “special” catnip in your cat food to make cats hallucinate? If so, I’ll have what he’s having. Previous Post Meet the cows at the Fresh & Easy ranch! Oh lord…Justin Bieber has invaded cat commercials too now, huh? 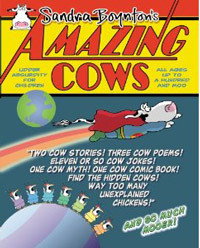 And flying cows…wow…..One strange adventure! 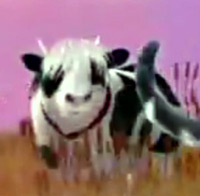 This reminded me of a cat food commercial I saw online the other day….it didn’t have cows in it but it was so cute! This girl arrived home to find this little adorable white kitten mewing at her and as she picked it up, she noticed on the collar it asked, “Will you marry us?” Of course, her guy comes in then! I couldn’t help but go AWWW…a cute kitten AND an adorable marriage proposal! What commercial is this?! Then they showed the guy feeding the cat some food and I saw it was a cat food one! Hmmm….Doesn’t make me want to buy cat food…course I don’t have a cat either! Oh, I’ve seen this video too, it’s for Fancy Feast. Here’s the whole commercial (no cows in there!). Well that would be one heck of an advert if it made you buy cat food without even having a cat!